Mrs Norman Granz didn’t raise no stupid chillun. I say that with confidence because in 1952 Norman Granz brokered an introduction that was a eureka moment. The immediate result was this seriously sublime album. If ever I were asked to define jazz I wouldn’t even have to think about it – here are six exceptional musicians each at the top of his game plus a completely one-off unique voice, all totally at ease basking in each other’s talent, not giving a hoot if anyone else likes what they’re doing – which happens to be manufacturing industrial strength moonglow. 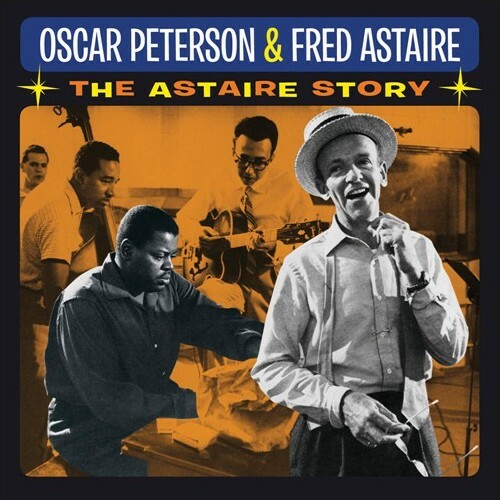 The sextet in question are Fred Astaire, the only non-musician; Ray Brown, bass; Barney Kessel, guitar; Oscar Peterson, piano; Flip Phillips, tenor sax; Charlie Shavers, trumpet; and Alvin Stoller, drums. There are those who will tell you – with a straight face, yet – “Fred Astaire can’t sing”, “Fred Astaire doesn’t sing” and “Fred Astaire has no voice”. This is duck soup to refute: Neither Could, Did, nor Have, Mabel Mercer. End of. In fact I can think of no greater compliment to pay Mr. Astaire than to describe him as a male Mabel Mercer. Neither sings in the sense that Frank Sinatra or Ella Fitzgerald sing but both are without peer at interpreting a lyric. It would be wrong to think of this album as Fred Astaire Does The Great American Songbook. True, you’ll find samples aplenty – “Night and Day”, “S Wonderful, “Cheek to Cheek”, etc, but this is precisely what it says on the tin, the Astaire story – and what a story it is. Irving Berlin wrote “Isn’t This a Lovely Day to Be Caught In the Rain” as a plot song for the Fred Astaire-Ginger Rogers film Top Hat in 1935. From the very first plaintive note of the verse we get the feeling that Fred, with a little cable-stitching from Oscar, is writing the song as he goes, lagging until the last possible moment before releasing a word, fielded by Oscar without missing a beat, the whole thing laced with filigrees from Shavers’ muted trumpet. After a chorus Flip Phillips comes in for 16 when he’s joined by Shavers and Fred comes back to take it home. This isn’t just small combo plus voice; there’s another element present throughout. Charm. If you don’t get that you may just as well bin the album and open a vein because it permeates the album like chic permeates Coco Chanel’s salon. There are 34 more or less conventional songs and a half dozen of what may be called “instrumental plus”. Granz had a large board, about six feet square, brought into the studio and placed on the floor. He asked the boys to ad lib a fast, slow and medium dance and Fred would kinda sidle in and start tapping. This was so successful they encored with “Jam Session for a Dancer” and “The Astaire Blues” and “Second Astaire Blues”. After that there was no way this could be called anything but a jazz album. In 1952 it was launched as four vinyl albums in a stout presentation box, roughly the size of a coffee-table book. Now it’s a two-CD set that will fit into a jacket pocket. But rather than diminish it has grown in lustre. I’ve had my copy a matter of days and played it for hours. Every January the editor asks the reviewers at JJ to nominate their 10 favourite albums of the previous year. In 2019 I’ll have a jump on my colleagues cause I already have One, Two, and Three right here. Astaire (v); Peterson (p); Charlie Shavers (t); Flip Phillips (ts); Barney Kessell (g); Ray Brown (b); Alvin Stoller (d). Los Angeles, December 1952. *Bonus track. Personnel as above but sub Ray Ellis for Barney Kessel (g). Los Angeles, December 1955. "...six exceptional musicians each at the top of his game plus a completely one-off unique voice, all totally at ease basking in each other’s talent..."